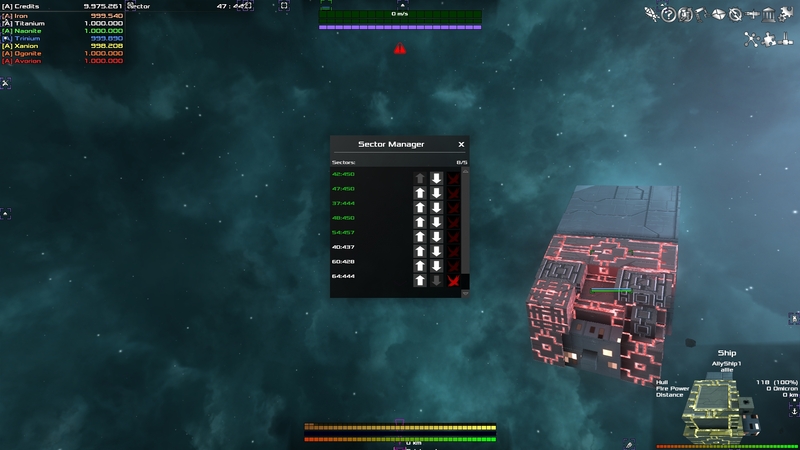 A small proof-of-concept mod to keep a set of sectors loaded, while a player is online. Select the sectors to be kept open yourself. Every player controls its own set of sectors. Note: As a serverowner you might want to set "aliveSectorsPerPlayer" to 1. As this mod will simply ignore that. Use the config file to set the max number of allowed sectors. Place the contents of the "data" folder into your /steam/.../Avorion/data/ folder. This will overwrite .../entity/init.lua and .../player/init.lua. If you have any other modifying one of these files you will need to merge their content. Place the contents of the "mods" folder into your /steam/.../Avorion/mods/ folder. - added init scripts, which gives all players access to the sector Manager by default. - Had to move files. This requires a full uninstall of the previous versions! A chunkloader for Avorion! Brilliant. - added init scripts, which gives all players access to the sector Manager by default and makes setting it up a cake walk. We've discussed this already in private, but I just want to voice publicly also that your Sector loading functions have been a big inspiration in helping me do what I needed for my own mods. Thank you for this work, Laser! I apologize if this is abundantly obvious, but what is the point of wanting to keep multiple sectors "open" like this? I'm still somewhat new to all this, so I'm not sure. Is it to make loading into the sector quicker? Is this useful for solo play? By default all sectors are unloaded (and if never visited, they aren't even created). Obviously upon joining a multiplayer- or starting your singleplayer galaxy the sector you are in will be loaded. There is a limit for how many sectors stay loaded per player. In singleplayer it's 500 and for multiplayer it's 5. Those values can be adjusted in the server.ini. Furthermore all sectors with player ships or station will get a score or weight. If I remember correctly you get +3 for stations and +1 for each ship (none for fighters). The sectors with the highest score will stay loaded. Is this supposed to be equivalent to the state of a system with player presence? Or it means off sector calculations for mining and player stations run in these sectors and that's it? I was wondering if it were possible to use a similar method to fake player presence in a sector. Keep all entities loaded ect. I will give a more in depth view on which sectors may get loaded, into what state and at what time. The default Avorion galaxy has 1,000,000 (1000 x 1000) Sectors. Keeping all of them loaded at once takes far more computional resources than anyone could reasonably afford. Hence only sectors of interest for the player are loaded. If there is no player (e.g. in multiplayer), then no sector is loaded. An unloaded sector sees no movement, no ships enter it and no other events. A player can never load more sectors than the `aliveSectorsPerPlayer`-config option in the server.ini (located in your galaxies save folder). Let's call it threshold. By default for singleplayer it's at 500, for multiplayer it's 5. The player's current sector couns towards those limits! If a player has more sectors with a weight > 0 than the threshold allows, only those with the highest weight will be kept loaded. There is no direct way to see the weight of a sector (and no modding interface either! ), but if you have a large enough force in a sector, then you will see a dim green surrounding in the galaxymap- which is proportional in size to the number of ships and stations in that sector. There are also small white dots for every ship in a sector. If you give orders to a ship which will have it move to/through other sectors, then the next sector will be loaded and the ship jumps into it. And if this target sector didn't gain enough weight through the moved ship, then it will be unload shortly after (15-20s). Giving orders to a ship that is in an unloaded sector gives the following message: "That sector isn't loaded to memory on the server. Please contact your server administrator for help." All of this is the same with alliances, except that any player joining triggers loading the sectors to above rules. As far as I can tell the number of players has no effect on the amount of sectors that an Alliance can load at the same time. This should conclude when, what sectors get loaded. unloaded: Nothin happens in there. player loaded: Full action at 20 ticks/s. Here is where the fun is. Weak loaded are the interesting ones. They weren't always part of the gameplay (added in 0.12). Before sectors -without players- would stick around for 5 minutes and then get unloaded. By default they update at 2 ticks/s, which is 1/10th of player sectors. When you notice that mining-/salvagingships give less resources per seconds its's also related to them getting less update-ticks. The long decimal number is due to float-point-arithmetic inaccuracy. If you find anyone who asks why his ships are mining slower than when he's in the sector show them this post. I've written all I know about Vanilla sector loading in the previous post. This should fix my problems. Btw knowing all this, my problem does look like a bug. I have 3 ships, and they get stuck like this often, even though the game should have two sectors loaded, (nowhere near the 500, nor the 5) I exit one and they get stuck, or maybe one follows the other doesn't. If I go back it gates immediately to the new system. Anyways with Sector Manager, and changing the update interval , now mining at least seems to work, so thanks again. In some tests few months ago I could not confirm the x+1, it seemed to be just be 5 on multiplayer default setting, not adding one for the current sector. Did not do further tests though, but I think the few tests I did were accurate. Btw: Awesome mod, will try it sooner or later. Its been really missing in vanilla game. The sectors eventually go to sleep, does this not work with alliance ships. or did i not configure the mod properly.